Open Source ECM vendor Nuxeo included several new features in the latest release of Nuxeo Document Management. Nuxeo DM 5.3 highlights include support for OpenSocial API, tagging, SharePoint and interoperability with CMIS Server as an add-on component. On top of that, Nuxeo EP 5.3, the vendor’s enterprise content management system core, reached the RC stage. This time around, Nuxeo concentrated on the increasingly popular social applications support and a few other things that many DM users may find helpful and welcome. Using Nuxeo’s support for OpenSocial — a common API for social apps access across various websites — users can add and/or build social networking gadgets, for example. Nuxeo DM 5.3 serves as both the publisher of gadgets and the OpenSocial container. Just for comparison, other known OpenSocial containers include MySpace, Ning, LinkedIn, iGoogle and many others. CrownPeak, a SaaS Web CMS vendor, also did an OpenSocial integration back in early 2008. Microsoft SharePoint can be accessed from Nuxeo DM 5.3 for basic library services and common file operations. For those die-hard fans of Windows Explorer, there’s a native integration, so they may not even know they’re working with another document management system. There’s also a Microsoft Office integration that allows opening, saving, editing of files directly to/from Nuxeo DM. It was about time Nuxeo put more effort into tagging and metadata capabilities of their DM system. The new tagging service is fairly easy to use and allows users to categorize content by applying existing or adding new tags. Tagging can then result in more ways for retrieval and display of content stored in Nuxeo DM. Tagging recommendations and dynamic tag cloud are also part of the deal. The vendor also says they improved search and indexing, which should play in nicely into the tagging offering. Having been longtime fans of CMIS, Nuxeo added interoperability into this release as well with their add-on CMIS Server, which is based on the CMIS draft 0.62. The most current (and the official OASIS Technical Committee) CMIS draft is 0.7. The idea here is that organizations can use Nuxeo DM, while also being able to search across multiple ECM, ERP, DM and other systems. Currently an RC, the new version includes that same WSS (MS SharePoint), tagging and OpenSocial widgets support we’ve seen in DM 5.3. In addition to that, the import/export service was improved and performance is said to be enhanced following some benchmarking efforts. The Nuxeo EP 5.3 RC also features a CMIS implementation based on Apache Chemistry that we discussed early spring — both with Nuxeo’s Florent Guillaume and Day Software’s David Nuescheler. It would be unreasonable not to notice the wave of recent activity at this Paris-based open source ECM vendor. With new people on board and an aggressive product roadmap, Nuxeo (if not disrupting) is clearly starting to gain more traction in the global enterprise CMS market. In the end, when it comes to open source, successes can be measured by the activeness of the community, as well as customer growth — among other metrics. In the U.S., for example, Nuxeo still has quite some space to spread its wings, if the vendor wants to. And we tend to think it will. Jahia, an open source CMS vendor, is on a quest to further penetrate the U.S. (among others) market in addition to its French operations. The new global Jahia Business Partner Program gives partners more control and flexibility with free presales support and various levels of certification, including those for VARs and SIs scenarios. According to Jahia, they don’t want to compete with their partner network when it comes to CMS implementations. Hence, the “non-compete guarantee.” That means Jahia plans to refer almost all of the integration work to its partners – around 70 of them in 15 countries around the globe. Some of Jahia’s partners are in the U.S., the market to which Jahia is paying more and more attention. While having an implementation partner network is a common approach in the industry, why not do that work in house? Why not move toward a native Professional Services approach? Sure, it’s more costly and requires to have, grow and nurture the in-house subject matter expertise. While it’s certainly not a deal-breaker in many CMS selection processes, different organizations may feel differently about partner vs. vendor implementations. That is a conclusion Basex, an analyst and research firm, came to in a (at times, admittedly questionable) report entitled Content Management Systems: The New Math for Selecting Your Platform released in September 2009. The researchers are saying the content management market is set to explode in the next several years, and open source CMS vendors are contributing to this growth, as well as to how customers are changing their CMS selection processes. Let’s take a look at details — some of them you may find quite amusing. Basex estimates that the U.S. market for content management reached about US$ 4.1 billion in revenue in 2008. By 2014, it should jump to US$ 10 billion. Basex says that Alfresco and Bluenog are “leading the charge” in the commercial open source market. Umm, many may not agree with this stance. What about players like Nuxeo and Acquia? If we were to judge market leadership by the number of customers and license deal sizes mentioned in this report, the math wouldn’t be the same. But let’s go on. Breakdown of CMS vendors into tiers in this report is slightly unconventional with Microsoft ECM and SharePoint sitting right next to Percussion and Alterian. Not to mention the lack of clear differentiation between on-the-premise and hosted/SaaS vendors. One would imagine this distinction would be of importance to many organizations selecting a CMS. Leaving out DotNetNuke and eZ Publish from commercial open source CMS vendors seems like a significant omission. Some would argue Basex putting Bluenog in the commercial open source box – actually, we’ve heard that debate before – with its technology mix of proprietary code, Apache and other open source software. While the report is profiling 16 CMS vendor, the most mentions seem to be given to Bluenog and Alfresco (approximately twice as many, compared to other open source or proprietary CMS vendors). If in fact, certain vendors were involved in the makings of the report as underwriters, it would be nice to disclose that. She is well-versed in matters of Enterprise CMS, Enterprise 2.0, collaboration and social media; specializes in VQA wines, weaves in candy and aspirin into one sentence and posts some of the yummiest foodie tweets out there. Soon after her resignation, the former Open Text-er was asking on Twitter whether 6 pairs of shoes would be enough for one week in Paris, there was a chance that French bistros, Père Lachaise and walks down Canal Saint-Martin were not the sole purpose of the trip. Meet Cheryl McKinnon, who, as of today, is the new Chief Marketing Officer of the Paris-headquartered open source ECM vendor Nuxeo. As the new CMO, McKinnon plans, first of all, to put the right team in place (Will we see former Open Text-ers there?) “to make a big bang in the U.S.” and work on Nuxeo’s messaging across the web, print and other channels to deliver “what business and technical buyers need to hear about.” We should expect to see at least 15 more hires in sales, product development and engineering in both Boston and Paris, according to Nuxeo. In addition to that, Eric Barroca, Nuxeo’s CEO, “reached out and painted a picture.” No, he didn’t exactly DM her on Twitter, but this level of personal recruitment made McKinnon feeling “obliged to return the call,” even though she returned none of head hunters’ calls. 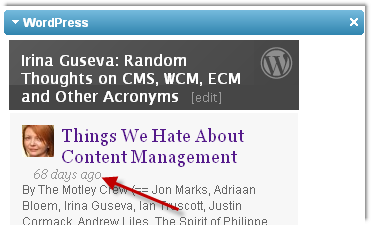 Many in the content management industry (and beyond) seem to be slightly obsessed with the buzz that the “cloud” is. The opinions can be quite polar, but for now we’ll concentrate on those embracing virtualization. In today’s interview, Emmanuel Garcin, VP and GM in North America for open source CMS provider Jahia, shared his thoughts about cloud trends and told us how Jahia is going about it with the newest release of Jahia Cloud. Did you ever think Zipcars were a more flexible option than, say, Hertz? Jahia is transferring this principle to web content management (+/- one JVM). In his brilliant Zipcars analogy, Garcin explained how he thought the service was really cool, alluding that the ECM industry could use more flexibility. You can rent a car with Zipcars for even a half an hour, depending on your need. You have a choice of a Chevrolet one day and a BMW the next day, depending on, for example, which girlfriend/boyfriend you are going to pick up that night ;). It is all about the flexibility and responding to customer needs. The content management industry could use the same levels of flexibility when it comes to hardware in the cloud. It would be a different business model, depending on a customer’s needs, where customers can pay per JVM, if JVMs are only used on demand. The point of this story and the main goal of Jahia is to allow flexibility for the customers, concluded Garcin. Well, if it isn’t open source CMS and PHP companies playing friendly again… Open source, PHP5-fueled Enterprise CMS vendor KnowledgeTree announced its embrace of the PHP-driven Zend Technologies in a partnership that aims to increase speed and performance of KnowledgeTree’s products. Part of the partnership revolves around the forthcoming version 3.7 of KnowledgeTree’s on-the-premise commercial edition (due in Q4 2009) being deployed on Zend Server. Looking for instant gratification? According to Philip Arkcoll, product manager at KnowledgeTree, the Zend partnership “represents the coming together of two PHP players whose goal is bringing enterprise-grade PHP products to the marketplace. KnowledgeTree on Zend Server delivers speed, performance, and reliability, particularly in Windows environments. In fact, early tests show response time improvements of close to 40% when using Zend Server, and that’s with no changes to our application.” No word on how Linux behaves, but the vendor say this OS is supported as well.